In the first of a number of Leading Thoughts for the Anthroposophical Society Rudolf Steiner defined Anthroposophy as “a path of knowledge to guide the Spiritual in the human being to the Spiritual in the universe.”1 This is in keeping with the ninth statue of the General Anthroposophical Society, which begins “The purpose of the Anthroposophical Society will be the furtherance of spiritual research; that of the School of Spiritual Science will be this research itself.”2 It is clear that Steiner put the path of schooling at the center of the Society. Although Steiner most commonly spoke of the connecting human beings to the spiritual worlds, in more colloquial terms we might say that the aim of Anthroposophy is to reunite man with God. The extended act of creation that Steiner describes in Esoteric Science3 and elsewhere has brought us to the point where we are able to take responsibility for our own development in order to continue our ascent. If we are successful, we will bring to the reunification our ability to work and live out of love. We were born out of the spiritual worlds through the creative acts of divine spiritual beings. We came to an awareness of ourselves as human beings through the process of error, and its redemption. We will return to our home in the spirit, and carry with us the fruits of the love that we have brought alive in us in the process of transforming ourselves. This is the grand vision that Steiner sets before us. The tools that will help us in our return to God are called the Anthroposophical Path of Schooling. It is to these tools that I want to direct my attention in this article. 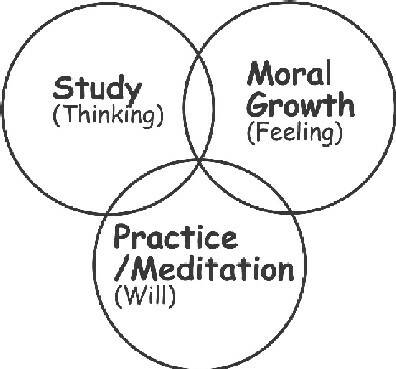 There are three aspects to the Anthroposophical Path of Schooling (Figure 1): study, moral growth, and practice (or meditation). Each of these elements plays a vital role in our growth toward God. We cannot dispense with any of them. Study orients us to the geography of the spiritual world. Moral growth directs us toward the Truth.4 Practice opens our spiritual eyes and ears. By understanding these elements we can make sense of the many different exercises Steiner gave. Examples of some of these exercises will be given below. Each of these three aspects is associated with a soul function (Figure 1). Study is a thinking activity. Moral growth purifies our feelings. Practice engages our will. Viewed in this way, the Anthroposophical Path of Schooling can be seen as a method of using thinking to purify our feelings for the purpose of freeing our will. The separation of thinking, feeling and willing frees these soul functions to be used for spiritual perception.5 In the following sections I explore each aspect of the Anthroposophical Path in more detail. Study of Steiner’s books and lectures, and study of other religious and spiritual traditions, provides us with the information necessary to find our way in the spiritual worlds. It allows us to recognize the adversarial and divine beings, and to make sense of our experiences. Steiner’s books and lectures provide the clearest descriptions of spiritual perception that I have ever encountered, and thus are among the best subjects for study. However, if we restrict ourselves to these contributions we cut ourselves off from our fellow human beings. Like Steiner, we must read and make connections with the great spiritual literatures of the world.6 This enriches our view of the spiritual world, and can also provide assistance when we have difficulty with meditation, or get stuck in our personal growth. Although our goal is to gain knowledge of the spiritual worlds that Steiner saw so clearly and beautifully, we should not become dependent on his insights. If we are to develop our own ability to see the spirit, we must develop the ability to think for ourselves. Even study of contemporary spiritual teachers like Marianne Williamson7 and Carolyn Myss8 (among others) can help us develop this ability. It is not that these teachers have a better or clearer vision than Steiner. In many cases they do not. However, they do bring different perspectives. Exposure to these perspectives helps us develop a flexibility of thought that will serve us well when we begin to have our own spiritual experiences. A concrete example of how the study of other spiritual streams can assist our own development will make this clear. In the Tao Te Ching, Lao-tzu explains the relationship between the Master and the Tao. How can it be radiant? We can use this description as a guide as we establish our own spiritual perceptions. The Master is described as being able to live out of the spirit (Tao) because she does not cling to ideas. This is very like Steiner’s admonition that we should not reflect overly much about the intellectual meaning of our experiences. “Here it must be emphasized that the spiritual researchers should not lose themselves in reflections upon what this or that might mean. Mental activity of this kind will only lead us astray.”10 The play on the opposites darkness and radiance makes a similar point. Although the Tao is dark, it manifests as radiance because the Master does not interfere with its manifestation. Finally, Lao-tzu directs us to our own experience to find the validity of what he says. He invites us to look inside ourselves and see. All of Steiner’s work is directed to this end. Although I have spent the majority of this section in a discussion of the study of other spiritual movements, I do not want to give the impression that I undervalue Steiner’s writings. In my opinion, their study provides the best guide to the spiritual world. Without the grounding provided by these writings our assent would be much more difficult, if not impossible. Although we should study and respect the writings of other traditions, we should not neglect our study of Steiner’s books and lectures. These form the foundation for precise, scientific clairvoyance. In chapters four and five of HKHW Steiner introduces a number of other qualities that the student is advised to cultivate, for “anyone who follows these additional suggestions will advance quite far in esoteric science.”17 The qualities discussed in chapter four are patience, inner truthfulness, absence of curiosity-for-curiosity’s sake, education of our desires, letting go of prejudice, tack, gentleness, quietness, and maintaining a healthy environment around oneself. Just reading the list can cause us to wonder about our capacity to live up to Steiner’s expectations, at least until we remember his admonition about gentleness. “Such gentleness is one of the main methods of esoteric schooling. Gentleness removes obstacles, opening our soul and spirit organs.”18 This includes gentleness with ourselves. Practicing gentleness with ourselves removes the feelings of inadequacy that so easily arise when working with Steiner’s books and lectures. Chapter five continues the theme of moral development by giving a number of “requirements or conditions for entering into esoteric training.”19 These are “conditions” not “practical advice” because without an effort to fulfill these requirements we cannot attain the goal we seek - entry onto the path that leads to a reunification with God. The conditions are demanding, but Steiner makes it clear that what is required of us is our striving to fulfill these goals, not our perfection. “No one can fulfill these conditions completely, but everyone can set out on the path to their fulfillment. It is our attitude and our will to begin that are important.”20 Like treading the path of reverence, these conditions cannot be met by study. They must be practiced as part of life. To do this, we must overcome our inner reluctance to undertake these tasks. This need to master ourselves makes the practice of the conditions a part of moral growth. Steiner makes this clear when, after reciting the conditions he says “And this will prepare us for the calm, inner peace we must develop during the first steps in esoteric training.”21 The attainment of inner peace is the attainment of a moral perfection. Chapter five contains seven conditions. First, we are asked to work to improve our mental, spiritual and physical heath. Second, to feel ourselves part of the whole of life. That is, to take responsibility for our own actions and to change ourselves based on this feeling of responsibility. Third, we must convince ourselves that thoughts and feelings are as real, and as important for the world as are actions. Fourth, we must become convinced that our true nature does not lie in the physical world, but within us. The fifth requirement is that we are steadfast in following through on a resolution once we have made it. Developing a feeling of gratitude for all that we receive is the sixth requirement. Finally, we are asked to bring all of these conditions harmoniously together, and to regard our life in the manner that these conditions demand. It should be clear from all that has been said that a purification of our feeling life is a central part of the Anthroposophical Path of Schooling. If there is any doubt of this, Steiner himself makes this clear at the beginning of chapter four of HKHW. “Educating our feelings, thoughts, and moods in the ways indicated in the sections on preparation, illumination, and initiation, fashions an organization in our soul and spirit similar to the one produced by nature in the physical body.”22 Here, in addition to feelings and moods he mentions the education of thinking. In studying the results of spiritual science we use thinking to educate ourselves about the nature of the spiritual world. When we undertake an education of our thinking we do not gain new knowledge, but learn to regulate the flow of our thoughts. This is one form of meditation, the topic to which I now turn. Steiner gave so many different types of meditation that it initially appears that they have no unifying theme. However, closer study reveals that they all involve some type of consciously willed activity that is used to transform thinking, feeling or both. In some cases (eurthmy training, for instance) the transformation effects not just the soul, but the etheric body as well. In cases like these the word meditation is stretched so far beyond its conventional meaning that it becomes almost inapplicable. It is for this reason that I used the word “practice” when I first introduced this subject. By practice I mean a willed activity that is used to transform thinking, feeling and perhaps other aspects of our being. If we restrict ourselves to the most common types of exercises that Steiner gives, for instance in HKHW, Verses and Meditations,23 and Esoteric Science,3 the term meditation can be used to good effect. I will restrict my usage in this way for the remainder of this section. Let us begin with one of the simplest types of meditation, concentration on an image or memory-picture.24 In its most rudimentary form, this type of meditation consists of holding a mental image in one’s consciousness for as long as possible. If this image is of a sense perceptible object, it is possible to place that object before one and repeatedly compare one’s mental image with the object, striving to bring the two into accord. This is part of what Goethe calls Exact Sensorial Imagination. To complete the exercise it is necessary to wean ourselves from dependence on the physical object. There are at least two ways to do this. First, there is Goethe’s method of Exact Sensorial Imagination. He begins with the leaves of a plant that shows a strong transition in form from the lowest to the uppermost leaves. The forms of these leaves are then imaged in the manner described above. After this he imaginatively creates leaf forms that are intermediate between those that he has seen on the plant. These leaf forms do not exist in nature so the images of them cannot be checked against sense experience. If done conscientiously, this method allows one to form images that have the same lawful necessity as the sense perceptible leaves. 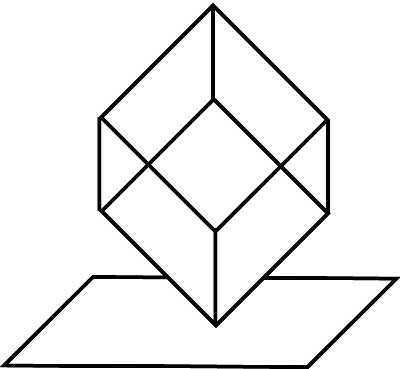 The second method of weaning ourselves from dependence on sense perceptions is best explained through a geometrical puzzle.25 Begin by imaging a cube standing on one of its eight corners. Now imagine that this corner rests on a movable, transparent plane (Figure 2). Since this plane is geometrical not material it can move upwards through the cube creating a plane figure on its surface. Initially this figure will be a point - the point on which the cube rests. As the plane moves upwards it will produce several different figures on its surface, before ending in a point at the top of the cube. The solution to the puzzle is the list of the figures that are formed as the plane passes through the cube. I will not give the answer to this puzzle as this would defeat the purpose of the exercise. This puzzle is a type of image meditation. Completing it strengthens our ability to form precise mental images. If you can form the image of the cube and plane with precision, you will know when you have the correct answer. This same type of meditation can be extended to other geometric forms. For instance, one can create mental images of all of the Platonic solids (tetrahedron, cube, octahedron, dodecahedron, icosohedron), and to work with them with a great deal of precision. Of course this takes strenuous inner work, but that is the point. The reason for undertaking these types of meditations is to strengthen one’s ability to visualize to the point where it is possible to form images that have the same lawfulness as do sense perceptions. Once we have developed this ability, it becomes easier to look away from our physical sense perceptions into a non-physical world. In effect, we learn to ignore the sense perceptible world and look into one with purely spiritual content. In Esoteric Science Steiner describes the process of eradicating one type of perception so that higher forms of knowledge can emerge.26 In working with images we strengthen our ability to do this. In a small pamphlet on meditation Dr. Ernst Katz points out the four-part structure of meditations.32 Though this structure is applicable to all meditation, I mention it here because I find it particularly useful when considering verse meditations. At the beginning of the meditation the meditant builds up a certain content that is then held quietly before his or her soul. In the meditations like that on the Rose Cross, this step corresponds to building up the thoughts and feelings described above. In the short verse meditation on Christ, this stage corresponds to inwardly hearing the phrase echoing from all of humanity. The second stage consists of erasing the content that has just been built up, and maintaining a quiet yet alert state. In the Rose Cross meditation this stage corresponds to holding the image of the Rose Cross before us. In a verse meditation, it consists of allowing our inner hearing to fade and be replaced by the quiet space to which the verse has directed us. This quiet space is non-verbal. During the third phase something new enters out of the silence. This is the spiritual fruit of the meditation. This new element may not be present every time we mediate, but it will be present sooner or later. The last phase draws the meditation to a close with a feeling of gratitude. This feeling should be cultivated whether the meditant feels that the meditation has been successful or not. Question: What must I do out of my ego when I meditate? The three aspects of Anthroposophical Schooling that I have spoken of in this article can be found as parts of all true spiritual schooling. For instance, in the first meeting with a Tibetan Lama the student is directed to study the great works of Buddhism, to lead an upright life, and to meditate. The arrangement of our path into these three branches does not make us unique. In fact, on the first page of HKHW Steiner indicates that “a form of schooling has always existed in which persons possessing higher faculties guide those who see to develop these faculties for themselves.”36 Thus, we should expect to find similarities with other methods of training. Although I have outlined three basic types of meditation, I want to acknowledge that the variation within each of these types is so great that another person might easily find more than three types of meditation in Anthroposophy. Although I would classify the sound meditations37 in HKHW with the text meditations described above, and would classify viewing the day in reverse with image meditations,38 other equally valid opinions are possible. I am not searching for the correct taxonomy of meditations. I only hope to bring a greater understanding to the Anthroposophical Path of Schooling by showing that there is regularity among the meditations that Steiner gave. In closing I would like to say a word about Steiner’s attitude toward speaking of spiritual perceptions. I have found that this is the most missunderstood aspect of the Anthroposophical Path of Schooling. This is striking because Steiner is absolutely clear in what he says. The topic is dealt with in three contiguous paragraphs in chapter two of HKHW. Here are the relevant portions of the middle paragraph. This is the paragraph that is most often cited when referring to Steiner’s opinion on this topic. This statement is clear, but it is not complete. What remains to be clarified is the context in which he makes these comments. In this section of chapter two Steiner is speaking of the beginning stages of spiritual perception. In the paragraph preceding the quote he says, “It is best, to begin with, not to talk about them, except perhaps with our teacher if we have one (emphasis added).”40 He makes this point again in the following, one-sentence long paragraph: “Once we can observe our inner experiences steadily, then we can speak about them and thereby inspire our fellow human beings to activity.”41 These two qualifications make it clear that the admonition to remain silent applies to the beginning stages of spiritual perception, when these perceptions cannot be observed “steadily.” Once the student has perceptions that are steady and reliable, they may be spoken of without danger. I hope that this will occur more frequently in the future. 1 Steiner, R. 1924/1973. Anthroposophical Leading Thoughts. Rudolf Steiner Press, London. 3 Steiner, R. 1910/1997. An Outline of Esoteric Science. Anthroposophic Press, Hudon, NY. 4 This is explained in relationship to the elemental kingdoms in Steiner, R. 1905-1908/1967. The Stages of Higher Knowledge. Anthroposophic Press, New York. pp. 14-19. 7 Williamson, M. 1992. A Return to Love. Harper Collins, New York. 8 Myss, C. 1996. Anatomy of the Spirit. Harmony Books, New York. 11 HKHW, see esp. Chapters 1, 4, 5. 12 “Spiritual science then provides practical rules which, when observed, help us to follow this path and develop an inner life.” HKHW, p. 25. 23 Steiner, R. 1961. Verses and Meditations. Rudolf Steiner Press, London. 25 I am indebted to Detlef Hardorp for challenging me with this puzzle many years ago. 27 Esoteric Science, pp. 291-294. Other examples of this type of meditation are given in chapter 2 of HKHW. Especially noteworthy are the meditations on the seed (p. 56-57) and plant (pp. 59-60). 30 Steiner, R. 1924/1994. Esoteric Lessons of the First Class of the School of Spiritual Science at the Goetheanum. Anthroposophical Society in Great Britain, London. Vols. I-III. 33 Steiner, R. 1924/1994. Course for Young Doctors: Meditative Contemplations and Instructions for Deepening the Art of Healing. Lectures for Physicians and Medical Students. Mercury Press, Spring Valley, NY. 34 The original text, its translation and a discussion of it are available in Katz, E. 1993. Meditation according to Rudolf Steiner. Rudolf Steiner Institute of the Great Lakes Area, Ann Arbor. 35 See also ibid, pp. 21-23.